Who doesn’t need energy efficient and functional garage doors in North Vancouver? The right choice of materials, doors, openers, and springs ensures proper performance, zero energy loss, fewer problems, and low maintenance. The assistance of our staff at North Vancouver Garage Door Repair is vital whether you need services or advice. We are all qualified and knowledgeable technicians in our company with up to date training and full commitment to our clients’ needs. You can trust us to fix, install, replace, adjust, and maintain your garage doors and their openers in North Vancouver, British Columbia. When it comes to residential North Vancouver garage doors, we are the experts to trust before you take decisions and for all services. Replacing the door is a big project. Let us assist you choose the right door and its components, and find the perfect opener for the new door. We can install all types of doors, ranging from overhead to roll-up and up-and-over doors. Need help to measure the garage? Want to buy a new door type? Thinking of getting an insulated garage door? Feel free to ask us any question and expect honest answers and smart solutions. 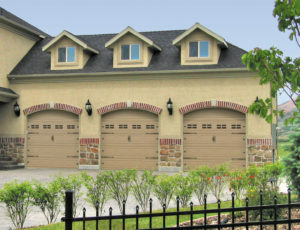 We make garage door replacement easy and guarantee proper installation of any door. You can also trust our work when you need garage doors repair. Snapped spring or cable? Misaligned sensors or tracks? Leave all problems to our experts. We come quickly to troubleshoot problems and provide repair services, which range from track repair to broken spring replacement. Never hesitate to call our garage door company if you can’t open or shut your door. We provide same day assistance when there are such urgent issues. Need lubrication maintenance? Want to adjust the door? Our team also makes safety inspection and offers routine garage door service in an attempt to fix the parts of the door and prevent future issues and possibly accidents. Get in touch with us for any service you need!